(clockwise from top) Still of River Dog; still of Dam Old Story; still of Kosi Katha. 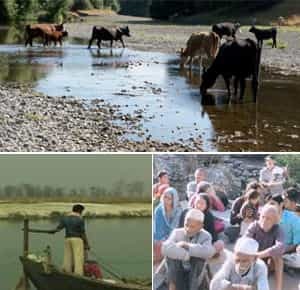 A mix of national and international films with water as the theme will be screened over four days at the sixth edition of the Voices from the Waters film festival in Bangalore, starting Thursday. Put together by the Bangalore Film Society, the festival seeks to bring together water activists, environmentalists, scientists, academicians, artists and essentially anybody who works with water to engage and debate on the various water issues. The festival opens with Touched by Water, a film by Canada-based film-maker Tamas Wormser. It explores the traditions of bathing and healing in ancient Rome and thereby man’s relationship with water and the rituals associated with it. “I wanted to make it a film from the perspective of people who suffer the war, and went to Hampi where several Israelis backpack to," he adds. But while the connect in Imam’s film is formed by water, there are other films on the schedule in which water is the crux of the film. Kosi Katha: The Making of a Famine, directed by Jharna Anurag Singh, is based on the 2008 Kosi floods—the destruction, the government response and the plight of those who live in the area, anticipating the next flood. The film festival will end with a day-long conference on the topic of water on 29 August. The films will be screened at the Alliance Francaise de Bangalore, YWCA Koramangala and Jawahar Bal Bhavan, with the inauguration at the Christ University auditorium. The other attractions of the festival are painting and photo exhibitions, art installations, interactions with film directors, scholars, grass-root level water voices and songs.